Like top-of-the-hour-news reports, preschoolers can get on loops that change only slightly from day to day. Mine has been ‘looping’ about the Blue Angels for a week or so now. We live in Annapolis, home of the U.S. Naval Academy. The mega-impressive demo team flies here during Commissioning Week each May and it’s one of the highlights of our town’s year. We also live near the Navy stadium, so we drive past a retired Blue Angel plane parked outside of it – at a vicious angle, no less – every single day. It’s no small wonder my son would have an interest. Thankfully, we are prepared. 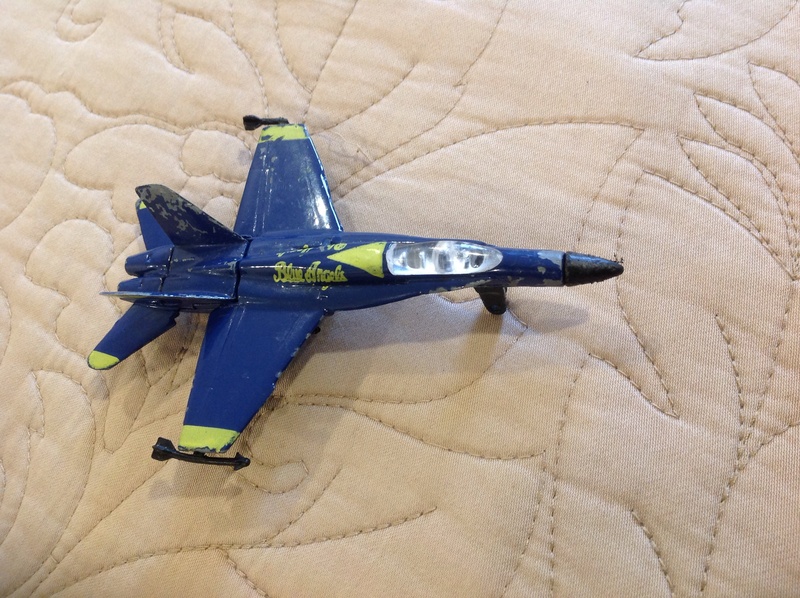 We’ve collected several small Blue Angel planes over the years. (See Exhibit A: attached photo). The dents and missing paint belie hours of death-defying stunts. My husband and I can answer most questions. If not, there’s the internet. Anyway, while my 4-year old son has been ‘looping’ lately on this fun topic, he’s also been circling back to a heavier one. I’m astonished, humbled, and proud to say that completely on his own, he has remembered to pray for his friends’ father every single night since I first heard him during bedtime prayers on October 30. (See Day 18) That’s nearly a month ago. When my son first heard about this man’s need, he and all his classmates only knew that “Ava and Charlotte’s dad was in the hospital.”* Now, he doesn’t know much more except that it was an accident and the twins’ father was hurt by some tree branches. But we parents have been told details. Things children don’t need to hear. He is still in the hospital. He still needs prayers. I think about this as I watch my son pray, and how his perseverance in prayer, is what faith is really about. It’s about not getting caught up in the details, but instead choosing to believe in a big, Big, BIG God. Yes, prayers might not get answered the way we’d like them to, but that’s not the point. The point is that in prayer, we acknowledge our need for God. So we carry on with our questions – about things for which we can find answers, and the things we can’t. And the peace that I feel when I spend time in prayer is all the confirmation I need that He is near, and hears me. And this is the confidence that we have in him, that, if we ask any thing according to his will, he hears us.